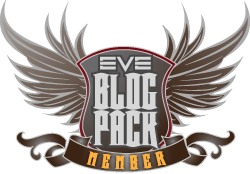 Welcome to the 52nd edition of our continuing monthly EVE Blog Banters! For more details about what the blog banters are visit the Blog Banter page. 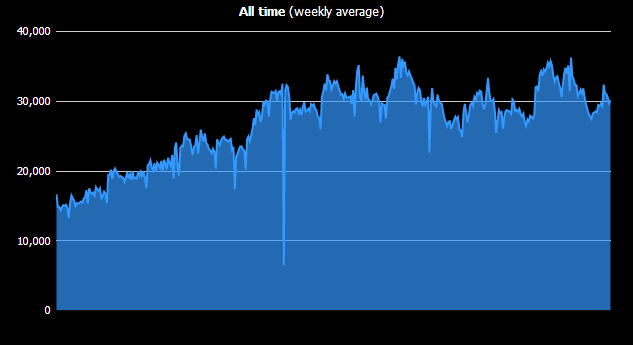 Go to the always useful EVE-Offline.net and take a look at the All Time (weekly average) graph for concurrent accounts logged in. What’s on the other side of that plateau? Is there any path for CCP to follow to raise those numbers upwards for a sustained period, or is EVE going to enter a decline to lower logged in numbers from this point? How soon will we see an end to this plateau? Months? Years? Or will you argue that ‘never’ is a possibility? Or you can look at the root causes of the plateau and tackle the question if it could have been avoided or shortened if CCP had taken different actions in the past. The answer is in the question, as is often the case if we’re willing to take a deep breath and look objectively. Games come and go. Ideas succeed and/or fail. There are many spikes in this industry. What is the next big thing? Oh, it’s already tanked. Well, this next game will be amazing. Meh. It was ok.
I’ve said this before and it will forever hold true – Players are fickle. I’ve also said this before and it still holds true – EVE Online is unique. Black Prophecy was the last big “EVE Killer” I heard about. Anyone even try it? I did. It was horrible. Now people are talking about Star Citizen, the unstoppable Kickstarter scifi MMO. Will it topple EVE? Maybe, but doubtful. As I said, the answer is in the question. EVE Online has been around for ten years. Over that decade they are the only game to show a consistent growth in subscriptions each and every year. They haven’t gone “free to play”. They actually have “Reverse free to play” via the PLEX system, the only ones in the market to be that forward thinking, but that’s not this conversation. EVE Online has shown a steady number of roughly concurrent 30,000 players logged in over the years as well. That’s a good thing. Plateau or not isn’t relevant. What’s relevant is the same steady number of players. That number never goes down drastically, yet subscriptions keep going up. What does it all mean? It means CCP is doing something right. Quote me on that. There is nothing more to discuss. The last generation of gamers had more patience, enjoyed a higher amount of risk and challenge. Things like permadeath and gear degradation; we were ok with it. But as a whole, the industry had to be dumbed down. Even EVE isn’t as hard as it used to be, but because it’s solely player driven, it’s a helluva harder than any other game out there. Even in this gaming generation of instant gratification children, EVE still holds appeal because of its unique nature. What is CCP doing right? They are staying true to the core concepts of EVE Online. Provided they continue to do that, I have no doubt that EVE Online will be around a long, long time, and that if we were to revisit this blog posting in another decade, we would all bear witness to continued subscription growth year after year. So what’s on the other side of that plateau? I don’t care. I’m quite content with a plateau as opposed to a downwards slope. I don’t think anyone outside of the Star Citizen FanBois expect the game to be an Eve Killer. If it turns into a decent game, I can imagine it ‘scratching that itch’ when a player is looking for a SciFi MMO to play with friends. As you point out there really isn’t anything else out there at the moment (Star Trek Online, LOL) Star Citizen can’t offer anything like the scale of Eve battles or the complexity of the market so players who love those aspects may well not even look twice at the game. But what about the tens of thousands of Eve players who do nothing but mine, run incursions or run missions? I can see many of those being sucked away if SC has compelling gameplay. If a half decent number of the 10 account multiboxer mining players or mission runners leave it could have a bigger impact on subscribers than we would expect. if 100 of those 10 account players quit, thats 1000 accounts. Will it kill Eve NO, could it reduce the sub number quite a bit, maybe.